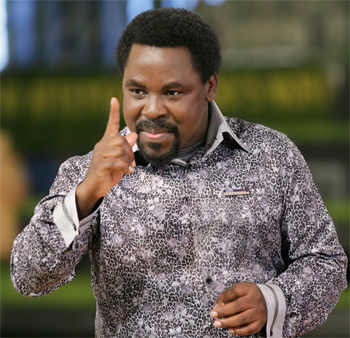 A Letter from Kabwata: Prophet TB Joshua Does It Again! On Saturday night, Chelsea Football Club beat Bayern Munich on post-match penalties and lifted the coveted UEFA Champions League Cup for the first time in their history. Didier Drogba was the man of the match, as he scored both the lifesaver and the final winning goal. But what has all this got to do with “Prophet” TB Joshua? Well, in the last few years, the prophet has become notorious for prophecies related to politicians or football (what Americans call “soccer”). The internet is awash with news items claiming that “sources” have told them that the prophet has predicted the death of a president or the final score sheet of a pending football match. Hence, in the streets of Africa, TB Joshua has become the latest wonder-boy. Everyone is talking about him. For instance, “sources” said that TB Joshua predicted that the Zambian national football team would lift the prestigious AFCON Cup early this year. In fact, the “sources” also said he predicted Didier Drogba’s heart-rending penalty miss—which could have buried the hopes of the entire nation of Zambia. So, even if you did not know TB Joshua prior to Zambia’s recent win, his name was added to our staple diet from that point onwards. Being a pastor in Africa, I have been asked again and again by people in the streets what I make of all this. Thankfully, my own church members know better. However, I engage in a lot of one-on-one and door-to-door evangelism, and this is one of those questions I get asked very often. It is obvious that TB Joshua and his predictions are on the minds of many Zambians (and Africans). Let me make just two comments about all this. The first comment I want to make is that many of the stories doing their rounds about TB Joshua’s feats amount to fictitious stories that are unverified. They get passed on from one hearer to another and grow larger and larger until they become “real”. They can best be included in the folklores that made up so much of African traditional stories, like the stories of the beautiful women that once used to walk dry out of the river at full moon to mesmerise village men and disappear back into the water! It is the same with the prophecy of Chelsea winning the Champions League Cup. I have searched the Internet looking for a clip where TB Joshua is saying in clear words that Chelsea would win the Cup but all I have found are statements that “sources” have said it. Here is a man who runs a TV network for 24 hours a day, and yet the one piece of information that is the hype of today cannot be found! In fact, what I seem to find are statements made just before the match claiming that he did not say anything of the kind. Perhaps someone can send me a YouTube link where he said it—and said it clearly. I am reminded of the many claims to healings that are made by “anointed” Charismatic preachers. Every week, there are tens of thousands of miracle services conducted across the country and the continent. When I say that these are just publicity and fundraising gimmicks, sincere Christians are often horrified at my saying so. When I then ask them to give me the name and address of one person whom they know who was once blind but now sees, or was a cripple (on a wheelchair or on crutches) who now walks, or was deaf and dumb but now speaks, they suddenly sober up and admit that they do not know anyone. “Sources” have told them of many people who have been healed. My second comment is that there is such a thing as demonic predictions. So, we should never conclude that persons who can foretell events are de facto God’s anointed servants; which is the extrapolation I seem to be hearing about “Prophet” TB Joshua. Perhaps the clearest example of a person who had such demonic powers in the New Testament is found in Acts 16. The Bible says, “As we were going to the place of prayer, we were met by a slave girl who had a spirit of divination and brought her owners much gain by fortune-telling. She followed Paul and us, crying out, ‘These men are servants of the Most High God, who proclaim to you the way of salvation.’ And this she kept doing for many days. Paul, having become greatly annoyed, turned and said to the spirit, ‘I command you in the name of Jesus Christ to come out of her.’ And it came out that very hour. But when her owners saw that their hope of gain was gone, they seized Paul and Silas and dragged them into the marketplace before the rulers” (Acts 16:16-19). Fortune-telling abilities have been with mankind for a very long time. They are a form of prophecy because they foretell the future, but they are not from God. In fact, in the Old Testament, God commanded that fortune-tellers must be stoned (Exodus 22:18). God expressly forbade enquiring from them about the unknown (Lev.19:31, Deut. 18:14). So, how can one know if a self-proclaimed prophet today is from God? (My confessional position is that the extra-ordinary gifts of the Holy Spirit—including prophecy—ceased long ago. However, since this is not the confessional standard of many readers of this blog, I will use another argument). God’s test, given to the people of Israel in the Old Testament, was based on the prophet’s teaching about God himself and his way of salvation. If the prophet’s predictions were true but his teaching was heretical, it meant that God was testing the people to see if they were really committed to him (Deut. 13:1-3). In other words, is “Prophet” TB Joshua preaching the true gospel of salvation? Here is something else worth noticing. In the Bible, prophets were prophesying about future events related to the consequences of the obedience or disobedience of God’s people. The prophecies were, therefore, meant to bring God’s people back to himself in repentance and faith, or to encourage them to remain faithful to God in dark times. They were not simply telling football teams whether they would win or lose a football match. Imagine Elijah, or Isaiah, or Jeremiah, or Daniel telling us who was to win some match in the great games of their day. Come on; give me a break! That is totally preposterous! Oh Pastor, I just love your sense of humour, but most importantly, I love your notch for TRUTH. And truth in two senses: God's truth and verified facts published! GOD is far greater than science after science is God; where science ends God starts. Evidence shows that in the modern ministry of the church, the ministry of Tb Joshua, at Scoan, Nigeria who heals and delivers evil spirits by the power of Jesus Christ, have come to prove to the world that those scientists are wrong with their claims, the fact remains that there are a few great ministers of God around the world that are healing by the Power Of Jesus Christ. But in the case of Tb Joshua’s ministry, the incredible healing and life restoration taking place there is so massive and mind-blowing. Terminal illness and disabilities are medically verified as healed. Medical science must be dumbfounded by the new reality especially now, that TB Joshua, Scoan, Nigeria have anointed five wise men and more are coming he said, which include female (wise women), to established an unmistakable fact that the future of the world lays in the hands of the church of God, and those speculations made by the founders and philosophers of science and medical science will not see the light of the day for God is the creation of heaven and earth including science. Tb Joshua does say that “Doctors treat; God heals, God is the one that motivate doctors to treat, medicine is Nature”. Prophet TB Joshua does not just say it but has proven it all the time through the mind-blowing healing power of God in his life. The question is not, will medical scientist accept the easily verifiable facts of thousands of healed persons. Jesus don’t need scientific approval ! Let the healed speak for themselves. The best place to truthfully learn all about the invisible spirit world, how it causes depression etc, dreams and how dreams and spirits effect our lives and the value of true knowledge is on Emmanuel.tv or Dstv CH 390 24hrs daily. See real people and listen carefully to their own testimonies. Scoan in Lagos, Nigeria has been examined by independent international spiritual leaders. Here you will also learn why you must not pay for Spiritual healings. It is written : "Freely the gift of healing is given to you, freely it must be given to those that need it". Dont believe any critics on this matter. The most powerful international spiritual investigative teams have confirmed it all as verifiable TRUTH. The people fighting and accusing Pastor T. B. Joshua are in this category. They are the false and fortune seeker Pastors. Such as Chris Okotie and some of his fellow Pentecostal fellowship of Nigeria members. They are not actually fighting Pastor T. B. Joshua, they are fighting the happenings of holy spiritual hearings at the Synagogue. They are fighting the miracles of God happening at the Synagogue. The hearings and miracles taken place at the Synagogue can only be by the anointing of the Holy Spirit of God. See it happening 24hrs a day, 7 days a week Emmanuel.tv or Dstv CH 390 24hrs daily Here you will also learn why you must not pay for Spiritual healings. It is written : "Freely the gift of healing is given to you, freely it must be given to those that need it". It's mindblowing to see the lengths his followers go to defend this false prophet. It is mind destroying to how far followers of the scammers at tbjoshuawatch will go to defend something that has no value to society. Millions of powerful people world wide that have received incredible life changing benefits, from The Holy Prophet TB Josua, are defending him world wide. Verifiable evidence is mounting that only serve to support what millions of people around the world have personally experienced. If Millions of people tasted a Mac Burger and love it. How many website will you need to make them say "it is a false burger.? TBJ never said Chelsea will win. You are right Pastor. I also agree that most of the items are hear say. But then on the spirit Of Divination which (I assume TBJ has),how can you our Pastors command it to leave him? (As per example from Paul in Acts). Or is this an extra-ordinary gift of the Holy Spirit which ceased long time ago? what happened to 'if you have faith nothing shall be impossible' or 'all things are possible to those that believe' or '.great signs and wonders shall those that believe perform'?? Iam just sick and tired about this man TB Joshua,surely we must be hearing about souls saved not how a preacher talked about which teams will win games!Totally irrelevant to the gospel of truth. I agree with your assessment that God would not want to use a Old or New Testament prophet to predict football game scores. I am sorry that you have never met someone healed miraculously. I would be happy to introduce myself to you as I was healed of an inoperable injury 29 year ago and still 100% healed today. I would also be happy to introduce you to members of our church in Lusaka who were healed and are healed today. I am so thankful that the "God who heals us" (Jehovah Rapha) has not changed His name to the "God who used to heal us". Physical divine healing is clearly in the redemptive work of Calvary. God bless and I enjoy your blog. Hi Pastor. find a link for one of the TB Joshua videos http://www.youtube.com/watch?v=vC7giIJT0pw&feature=relmfu.There is a whole lot more, the African President death, the death of assumed Steve jobs death prediction, and many more. TO THE LAW AND TO THE TESTIMONY,IF THE THEY DO NOT SPEAK ACCORDING TO THIS THEN THEY ARE SIMPLY NOT GODS PROPHATES.SECONDLY THE BIBLE SAYS MAY WILL COME TO ME(JESUS) SAYING DIDNT CAST OUT DEMONS AND PERFORMED MIRACLES IN YOUR NAME? AND THE LORD WILL CHASE THEM AWAY THAT HE NEVER KNEW THEM.DECEPTION IS THE MAJOR TACTIC OF THIS LAST GENERATION. It is not only him but even for all that are condemning him while they are still within the cage of religion and denominations. What we need is the Kingdom of God, period!!!!!!!!!!!!!!!!! Million of divinely healed people world wide support The Holy Prophet TB Joshua. Inspite of insane peoples prolonged attempts to destroy The Scoan Church, Nigeria, the Holy Church is growing or rather explosive growth world wide. The sustained unrelentless attack on Pastor T. B. Joshua and lately on Pastor Chris Oyakhilome by Pastor Chris Okotie because of Pastor Chris Oyakhilome's association with Pastor T. B. Joshua has led to a thorough investigation by our organisation of Pastor T. B. Joshua, Pastor Chris Oyakhilome and the accuser, Pastor Chris Okotie. Jst came across this. I am David, a Nigerian. While i wholly admit that false prophets are all around us i believe it is very easy 2 discern dem if 1 is truly regeneratd. Aldou like CH spurgeon said, discernment is known d diff between right & almost ryt. There are some false prophets dat rly look lyk d true ones. People knw d truth, dey only want 2 gada near wot dier itching ears wanna hear. But wit all due respect sir, God works wonders 2dei. Paul Washer is ma favourite preacher & he talks highly of u. I just neva tot u wud be a cessationist. The man who wrote this article is not a Pastor.You believe that extra ordinary gifts of the Holy Spirit have ceased,as a 'Pastor',you just assume a position that is not based on the scriptures,well to say the least that is very strange.The word of God says,"These signs shall follow them that believe,in My name shall they cast out devils,they shall speak in new tounges,they shall lay hands on the sick and they shall recover...".Which bible do you read,because it is replete with showing that God is the God who can do all things,and that He is the same yesterday ,today and foreever.Your god is a figment of your own imagination,if He can do only what you also can do,or even less,why then do you need him.How can you worship something that is at your level or even below you.Your god is an idol which does not speak,see or hear.The God that we worship is the Almighty God of the bible who is still doing what He used to do during the time of the Apostles.Iam not arguing TB Joshua's case,but I cannot keep quiet when you trivialise the God of the armies of Israel.If He is not doing anything in your life then I suggest you get born again and start a relationship with Him before you start teaching others about a God you know nothing about.Spiritualy you are not even a child,you are blind,and its a case of the blind leading the blind.And I gather you are Pastoring other people,their blood will be asked at your hand,not because of TB Joshoua,but because of preaching a fake God,an idol.To us Jesus is alive and still doing things. Hi Collen, it seems people world-wide expect a pastor to be a god. To start with it is unbiblical to have one man as pastor in a church. If you read carefully Eph4 you will see that Jesus Christ is the one that gives the gifts Apostle, prophet, teacher, pastor and evangelist. Therefore, can you go for training to become a prophet??? "My confessional position is that the extra-ordinary gifts of the Holy Spirit—including prophecy—ceased long ago" - This is heresy and is contrary to the scriptures. You article was spot-on until the point you added what's quoted above. I would boldly say it became polluted. Jesus said greater works than these shall you do (John 14:12). We know from the scriptures that He prophesied etc (e.g John 21:18). Am surprised many of the commentors above ignored this clear error on the part of the writer. We can't start criticizing T B Joshua when we ourselves are teaching error. That's hypocritical. God demands that we have a pure word from Him that will nourish His sheep. Let us remove this leaven. "Jesus said greater works than these shall you do (John 14:12)"
--True, but He was speaking to the disciples, who, in fact, did do greater things as they took the Good News to the then known parts of the civilized world, accompanied by signs and wonders to confirm the message (a message, by the way, which is now confirmed by the canon of Scripture, illumined by the Holy Spirit). And of course Christ prophesied, He was the incarnate Word! I would assume that you would claim Luke 12:12 for yourself as well? Again, Christ was speaking to His disciples, who did receive prophesy from the Holy Spirit as they took the Gospel message to 'all the earth'. But now, the canon is closed. It was closed by Him who made it. The canon is closed. I don't agree with continuationists, but I have many godly friends who hold such beliefs, many of whom I may not see in the new heavens and earth because they will be much closer to the throne than I. How interesting that you are so quick to dismiss Pastor Mbewe for his cessationist beliefs, when he clearly respects his (majority) charismatic readership. Even if you are correct, your quickness in calling for removal of "this leaven" further displays your ignorance of what God's Word says (carefully read 1 John chp 4). For all of you who would dismiss or condemn Pastor Mbewe (and even go so far as denying that he is a Pastor), may God grant you repentance. Pastor Mbewe, may God continue to bless you and your efforts. And by the way, just to prove my point, I am a Reformed Presbyterian, so I do not agree with credo-baptism, but I am all but certain that Pastor Mbewe will be MUCH closer to the throne than I am. TB is preaching the "me first" gospel....using the Lord to get whatever you want money, health, blessing, MONEY....clearly contradicting the Bible message. Sorry, he has the wrong jesus....his preaching is not remotely similar to the Lord Jesus or the apostles. Thank you Pastor Mbewe for this article. I admit, I clicked through to hear your take on TB Joshua. In the end, I had a good laugh reading about football and was surprised(in a good way) that you don't even believe in the slightest this african claims of healings. I guess I'll have to think about it. I thought some of it was true. Which in ur view , Pastor , will have the attention of the youth of today more than football or proves the reality of the power of God . Of what consequence was Jesus telling the woman at the well that she had 5 husbands- apparently useless and ungodly information by your standards . that you are spiritually impotent does not mean power of God has ceased in our time ! If you are interested in those who have benefited from miracles , go to SCOAN urself and interview people . Surely , such a large group of people,day in ,day out including highly placed men and women of integrity(including many from your country can not all be phony actors ).the diff bw divination and prophesy is that there is inbuilt solution in the latter ; not the type that requires animal sacrifice and eventually laced with nightmares !!! Pastor, THANK YOU! My husband has been taken in by this snake of a man. I have been subject to his rage for questioning things, and told that I'm a stupid American Christian who doesn't know the Bible and doesn't know God. Of course this is devastating, as a wife, to hear. But my fear for my husband's spiritual and mental health under this man's influence far outweighs the hurt from his words. Be careful how you speak about the people of God! if your faith has stopped healing you, it does't mean God has stopped healing his people! I like yoursermons of the cross but you lost me when you say miracles stopped working when the Bible says rather differently. Which cross do you preach then sir. Am surprised. It's as if you are hurting and are jealous of what exactly God has given you and what God has given Pro. TBJ. Are you still using the bible. And those supporting you on attacking other ministers are wrong to . They are letting you bury your good works with your own hands as they clap. They needed to correct you. The God of Isreal is a God of miracles ...which God do you preach to your church sir????? Please repent for saying God of Isreal of the Holy Bible is dead. By the way how will God resurrect all for judgement if his power of miracles stopped years back.. Or will you tell me that there is no such a thing as resurrection too. "you shall see them by there fruits'' and this your fruit tells me i should not listen to you anymore. Lord God forgive Conrad Mbewe for suggesting you don't work miracles anymore. AMEN. Am happy that people are now adhering to the biblical requirement of testing and proving all things and spirits. We also need to examine ourselves as we examine others. LET’S EXAMINE OURSELVES BEFORE WE EXAMINE OTHERS. Remember that the Word (Genesis to Revelation) is perfect & correct, and has no fault in it. You will discover that, may be you have already, all denominations have faults but the originally inspired Word is perfect. Therefore, choose who to rule you, the inspired Word or your denomination? Every knee (Christian, denomination) should bow down to the Word of God. Now religion and denominations are man-made even if they condemn one another. Jesus Christ never formed a religion but called people to enter the Kingdom of God where God is God and man is man. In a Religion and denominations men are gods to the people. Who said there should be one pastor or one man leading a church? Is that what was in the New testament scriptures? search for yourselves? Embarrassingly uninformed. TB Joshuas prophecies are not passed by hearsay, but broadcast live to millions as they are uttered. They are all documented. The healings- likewise, many many thousands, all medically verified and documented. You have made yourself unwise by speaking out against a man you do not know. It is so clear you would not have written your claims if you had done 5 minutes of objective research. Please Please Pastor Kabwata, could you please come back to this forum and correct this error immediate because it is misleading and could push people away from Christ and you are to bear the blame. "My confessional position is that the extra-ordinary gifts of the Holy Spirit—including prophecy—ceased long ago"... Pastor Kabwata. Remember, Christ is not a Proud person. Please act quickly. Thank You. Julius. Pastor Mbewe, if you cannot perform miracles in your church, don't think that other pastors don't too. I have witnessed pastors in Africa and USA who perform healing and delivering miracles every week. Please please pastor you have many people who believe and following you, make your research before you write articles on your blog. I am surprised you are not aware of pastors healing with your experience. Where have you been all these years? A very simple way to find verifiable truth concerning miraculous healings, is to let the healed speak. Let the healed and previously demon possessed speak up ! When the healed millions, use just a small amount of their time to let the world know the truth, millions more will believe in the powerful LOVE that Jesus has for all. Pastor Mbewe: When I started reading this blog I really thought that the owner of this blog was fishing. It confused me when I got to the bottom of this blog. A true Pastor will have no problem to quickly find many persons that received incredible healings from Jesus.